Purefecto: Possibly the best lunch ever? It's very hard to decide the best lunch I ever had but if I have to choose a top 3, then one of them as to be Jean-Georges restaurant in NYC. First, the interior design for the restaurant is stunning; very understated and elegant. I think it's a perfect pairing with Jean-Georges' food. Second, the service was impeccable. No complaints here. 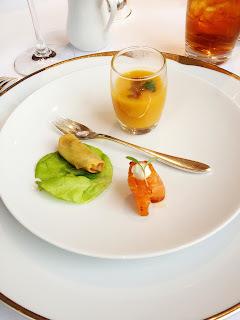 And lastly, the food.... it was divine (hello 3 Michelin stars). Everything was cooked perfectly and all the courses were equally delectable. I mean there is no bone to pick. Literally and figuratively. Seldom can a restaurant achieve perfection and Jean-Georges certainly did that gracefully. Can't wait to go back!